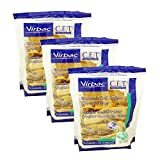 Interested in the Virbac Dental Chews CET605-3 30 Count Oral Chews (3 Pack), Large? Is the price too high? You can easily price watch this product and we'll notify you when the price reaches your target.